And we think she’s quite sweet. Shut up, you’re a loser. This time a couple of weeks ago Friday was just the day in which we’d have a mini dance at our desks and do a lot of counting down.Then Rebecca Black happened and suddenly Friday became “Friday, Friday, Friiiiday” and we started to get a bit OCD over choosing where to sit in the car. Bad times. But who cares about our confusion over the song and life in general when there’s a hate campaign going down? We’ve got to say we did feel a bit sorry for Rebecca, what with her trending on twitter and having her song called the “worst song ever made”, which yes probably it is, but still she’s just a kid, does she really deserve such backlash for being a bit rubbish? Now Becs has spoken out about all the hatred and has tried to win us round by using the best ploy possible – announcing to the world that she’s a Belieber. Uh. Take a look at her talking to Good Morning America. Aw, she is quite sweet right? Right? Oh come on, are you people made of stone?! If you haven’t heard Friday yet then click here at your peril. 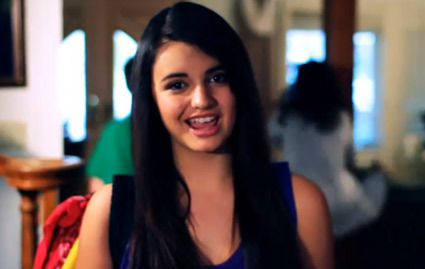 What do you think of Rebecca Black now you’ve seen her interviewed? Feel a bit sorry for her, or does she totally deserve it? Would you?